Innovation activity is learning, activity and insight. By learning, we mean: Adopting a common language and operational culture, getting acquainted with various operating models and tools, and peer learning from other organisations. By activity, we mean: Familiarisation with theoretical background, testing of new operational models and tools, as well as concrete utilisation of these models and tools in honing your development idea – “learning by doing”. We have around 30 tested tools at our disposal. By insight, we mean: Awareness of the significance of innovation culture components, assessment of the strengths and development areas of your own operational models, identification of operational models and tools suitable for you, and bringing new thinking to bear on the development of innovation action in your organisation. 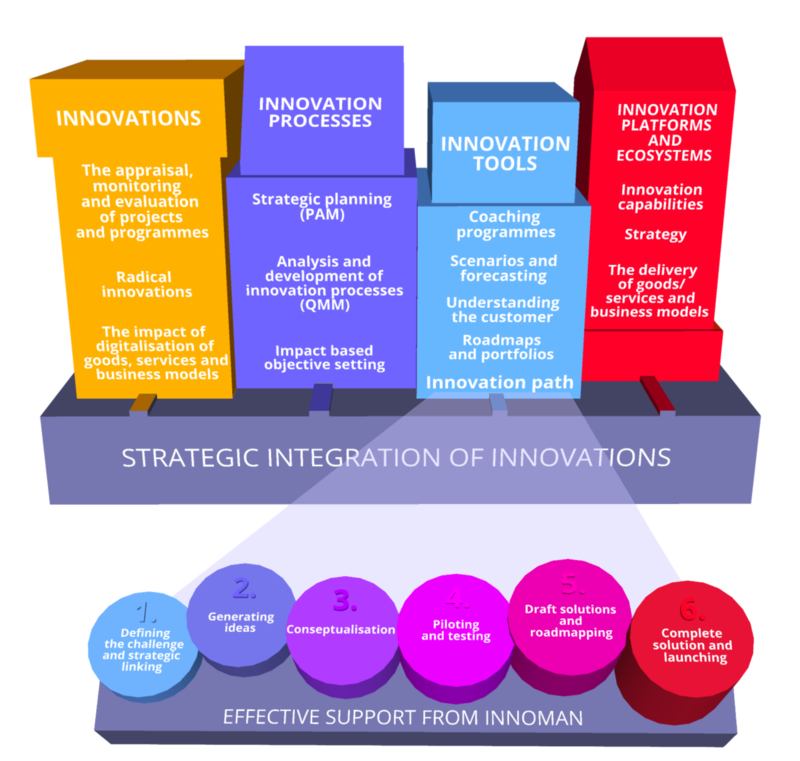 Innoman will help you innovate systematically. We provide the tools needed to improve the productivity of innovation. We will work together with you to produce innovations in the areas of new products, services, business models, processes and ecosystems. At the same time, your company will learn effective tools for future innovation activities. The purpose of the Innovation Path coaching sessions is to introduce your organisation to practices, know-how and skills that make effective innovation action possible. The modules in our coaching programme complement one another, and we can customise them to produce focused training sessions or longer training programmes. We will also apply our process tools to facilitating your organisation’s own development projects. Coaching can be introduced within the framework of coaching programmes or as separate workshops, according to the customer’s needs. Ecosystem path: A group representing your company’s ecosystem is assembled to develop common business models, processes and the goods/services it delivers. Innoman has put together the ecosystem of Finnish and international experts. Through this concentration of expertise, our customers have access to a diverse range of knowledge and experience as well as robust, flexible and comprehensive innovation services. "During the path, we learned about several new innovation and conceptualisation tools that can also be used in other projects", says Valio’s Innovation Manager Virpi Jonson.